May 25 What Is The Movie I Am Excited To See? 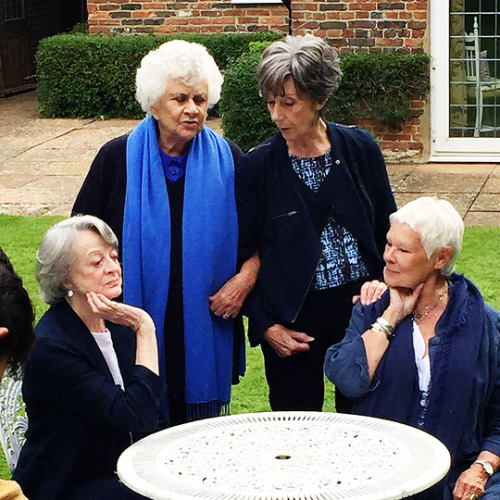 The Awesome Foursome in my eyes, the Dream Dame Team, Dame Judith Dench, Dame Maggie Smith, Dame Joan Plowright and Dame Eileen Atkins come together for what is geared up to be an incredibly funny documentary with the Dames taking a trip down memory lane in this enjoyable documentary showing the real side of these amazing women. A documentary I have locked into my diary after viewing the trailer below. These four English actresses have all lit up the screen in many movies. Instantly, if I see they are acting in the film, I know it is one I would more than likely enjoy, so I can't wait to see this one. And as by the reviews (many with four stars), it is going to be huge, so put in your diary now, grab the girls and enjoy a fun night out with the Dames. All four Dames have gone from being fledgling actresses in the 1950s to acting royalty. They’ve observed each other’s careers blossom and have celebrated life’s ups and downs together. NOTHING LIKE A DAME invites you to spend time with these acting legends as they talk about their lives and their professional experiences across Theatre, Television and Film. Coming to cinemas on June 7.